Type 2 diabetes is a permanent condition once it develops. The primary symptom is high levels of sugar in the blood – this happens when the body does not respond correctly to insulin, which is a hormone produced by the pancreas and released into the bloodstream. Glucose is a form of sugar that moves into the cells of the bloodstream so that the body can use it for energy – if the glucose does not enter the cells, but remains in the blood, it causes the symptoms of Type 2 diabetes which is also known as insulin resistant diabetes. Overweight and obese people have a higher risk of developing insulin resistance. This is because fat prevents the cells taking up insulin to convert glucose to energy. Type 2 diabetes usually develops gradually and may not be noticed by the sufferer for a long time. Treatment may mean taking insulin as an injection or can be less invasive. Some patients are able to control their blood sugar through diet and there is a special diabetic food pyramid to help you. Controlling diabetes through diet can also be easier if you stick to regular mealtimes. While this article contains general guidance, you should speak to your doctor or dietician for personal advice that is the best route to managing or preventing Type 2 diabetes for you. Eating according to a food’s Glycemic Index is important because it helps you choose foods that elevate your blood sugar slowly. Low GI foods are the healthiest for the general population as well as for diabetics. Examples of Low GI foods are wholegrain rice, whole oats, wholegrain pasta and all pulses. Once you’re diagnosed with Type 2 diabetes, your doctor or specialist will usually advise you to change your diet because everything you eat should be part of a recommended meal plan that will be devised with your weight, lifestyle and degree of diabetes in mind. If you don’t stick to the meal planner, you may develop complications resulting from blood sugar levels that become too low or too high. 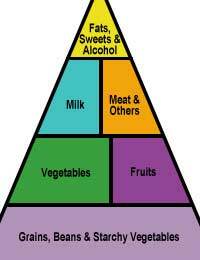 The diabetes food pyramid is divided into 6 food groups, very much like those of the standard food pyramid. Using the standard food pyramid to regulate your dietary intake is a good idea for a Type 2 diabetic as long as you pay particular attention to the three major food groups that can add to your health problems. Sweets, fats and alcohol make up the smallest part of the diabetes food pyramid. They should be eaten in small servings and ideally, should be reserved for special occasions only. You should eat less saturated fat which is found in meat and animal products such as cheese, bacon, and butter. You should eat sweets less often that most of the population because they are high in fat and sugar, when you do eat sweets, you need to make them part of your healthy diet by reducing other food intake, rather than having them as extra items in your diet. For many diabetics it is better not to drink alcohol but if you do insist, it’s important both to limit the amount you drink and to make sure you drink it with a meal to prevent it having an overly adverse affect on your blood sugar. You should talk to a health professional about what would be considered a safe amount for you to drink.